This book is utterly, utterly fascinating. It came to my attention in an email from Karen Browning at Penguin Press. Most unsolicited emails are a bit random and not always worth paying attention to, but I am so glad I read Karen’s email properly. This book is worth paying attention to. I read a lot of literary fiction, but I do love non-fiction as well, and stories like this are especially interesting to me – personal stories with elements of psychology, science, medicine, and intrigue. Like a good novel, only better because it’s real. I studied English Literature at university and have a Humanities brain, but science and psychology interest me immensely. The fact that Cahalan is a writer for The New York Post also interested me, as I knew it meant she would be a good writer and researcher, the latter being particularly important in her story as she has little memory of much of what happened during her ‘month of madness’. Susannah Cahalan was normal, healthy, busy with work, successful. But then she started behaving strangely, enough to worry her colleagues and friends. At first she felt a numbness in her left side, and then believed her apartment was infested with bed bugs when there was no evidence to suggest it was. She even saw ‘bites’ on her left arm and called an exterminator to rid her home of the bugs she thought were there. She became erratic, paranoid, and delusional. One night, watching TV with her boyfriend, she had a terrifying seizure that reminded her boyfriend of ‘The Exorcist’. After visits to the doctor and several prescriptions, her condition became so bad that she was admitted to the epilepsy floor at New York University Langone Medical Center. Though she had seen a neurologist, her violent seizures (including the one she had while waiting to be admitted) convinced doctors she needed to be on the epilepsy floor. She stayed there for the next month, and, as she repeatedly says, she was never the same Susannah again. She was tested for everything, and everything came back negative. All scans were normal, all results within healthy limits. But she had seizures; her motor skills depleted dramatically, as did her speech. She had hallucinations and delusions (one particularly vivid delusion being that her father was not her father but rather another person pretending to be him in order to play some sort of trick on her; she also believed they were talking about her on the news and in magazines). For all intents and purposes, Susannah seemed to have ‘gone mad’. A whole team of doctors from various disciplines were called in to assess and try to diagnose her. They sat with her and asked her questions, asked to complete simple tasks. She could remember her name and the president, but not the date. She could not repeat a sequence of numbers or letters spoken by the doctor. All her answers were slow and seemed difficult. Her personality seemed to be buried somewhere – Cahalan states over and over that, according to her family and friends and eventually to herself, it was clear throughout her illness that some part of the old Susannah was still within her, but could not take control over the illness. Because of the nature of my illness, and its effect on my brain, I remember only flashes of actual events, and brief but vivid hallucinations, from the months in which this story takes place … Using the skills I’ve learned as a journalist, I’ve made use of the evidence available – hundreds of interviews with doctors, nurses, friends, and family; thousands of pages of medical records; my father’s journal from the period; the hospital notebook that my divorced parents used to communicate with each other; snippets of video footage of me taken by hospital cameras during my stay; and notebooks upon notebooks of recollections, consultations, and impressions – to help me re-create this evasive past. Cahalan had to try and delve into her own psyche to piece together her experience, as if she was investigating herself. Initially she wrote an article for her paper, The New York Post, on which the book is based. 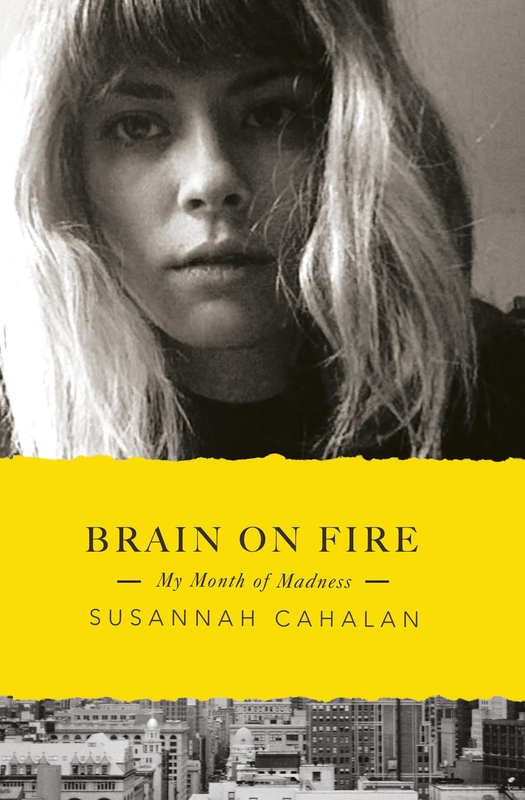 Her article attracted so much attention and praise (including the Silurian Award of Excellence) that she was approached to turn it into Brain on Fire, named for the way her saving grace Dr. Najjar described her condition to her bewildered parents. He was the first doctor to formulate a viable diagnosis, and his treatment saved her life. Dr Najjar, for one, is taking the link between autoimmune disease and mental illnesses one step further: through his cutting-edge research, he posits that some forms of schizophrenia, bipolar disorder, obsessive-compulsive disorder, and depression are actually caused by inflammatory conditions in the brain. Dr Najjar is in the midst of groundbreaking work that might finally sever the barrier separating immunology, neurology, and psychiatry. I can’t begin to imagine how this work might affect those afflicted by these mental illnesses – their conditions might have a totally different cause than originally thought and therefore could be treated in a totally new and more effective way. After finishing Brain on Fire I found myself Googling anti-NMDA-receptor autoimmune encephalitis and Dr Najjar’s work, as well as the work of the doctor who first identified the condition in students at the University of Pennsylvania, a Dr Dalmau. Most people will probably know or have encountered someone with one of the conditions Cahalan lists in the quote above, so this research could affect all of us. Crucially, if some mental illnesses are redefined with this research into autoimmune diseases, the stigma against mental illness that is unfortunately present throughout our so-called progressive society could be reduced. I for one sincerely hope that this happens. Susannah Cahalan’s case, as well as this wonderful book, will hopefully go someway towards achieving it. Apologies for any rambling, but I both loved and admired this book. Even as I was reading, there was so much to say, and so many possibilities. Published in November 2012 by Free Press, an imprint of Simon & Schuster, in the US and Particular Books, part of Penguin Press, an imprint of Penguin, in the UK. My copy was kindly provided by Penguin UK for review. Susannah’s original New York Post article. This book sounds so fascinating. It’s so scary to think that this could happen to anyone — and worse, that it might not be correctly diagnosed and treated. Great review! Thanks! Just goes to show how important it is for doctors to pay close attention to their patients’ conditions and try absolutely everything they can to help. So interesting. Thanks for commenting on my review Lizzi, a friend lent me this book which I had never heard of, nor had I seen any reviews, so great to come back here and read yours which is great, I agree, it is a totally fascinating story, as is the story of Doctor Najjir and his own humble beginnings. I wish I could be there for the reading, I am coming to London in Feb, but not until the 12th sadly. I do hope you do a write up on the event, you can tell her I’m spreading the word here in France. I am sure this book is going to be a word of mouth sensation. It has been so empowering for so many already and is so life-affirming. Enjoy the event! Great memoir. I learned a lot. The audio was well narrated. I made my sister who is a nurse read it.